Guests all arrive in the afternoon and get unpacked out of their travel luggage and into our waterproof river duffels. Everyone got acquainted with each other over snacks and beverages and we went through our safety briefings. 5 of our guests were returning and they had a general idea of what they were getting themselves into. 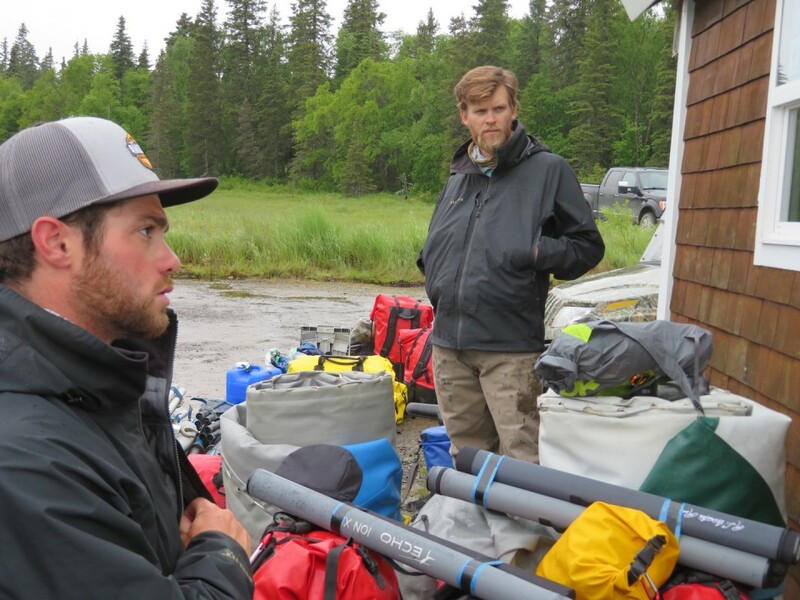 Pete lead the group in a map briefing which included an intimate 2D exploration of western Alaska and the Togiak national Wildlife Refuge. We would hopefully awake in the morning to see the real thing in 3D. 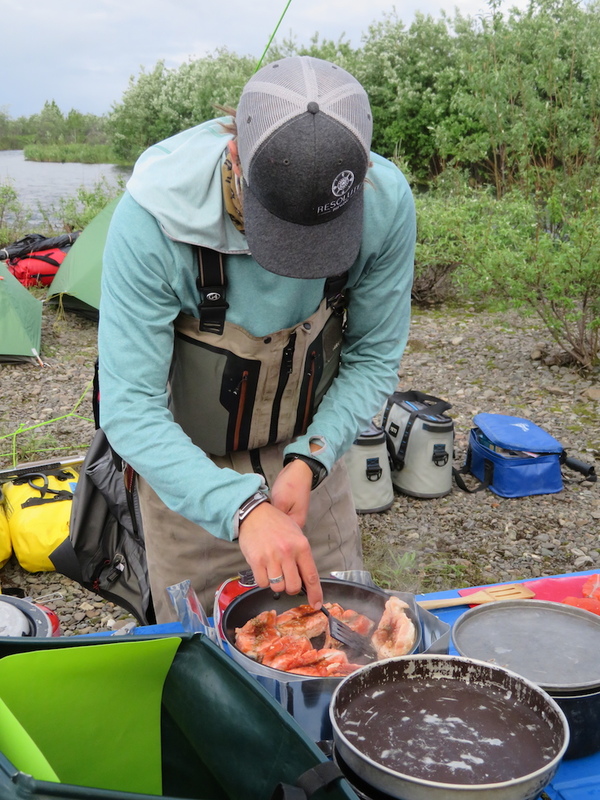 We ate a fresh local Sockeye dinner and called it a early night. It was a leisurely morning and guests were able to get a little more sleep. We enjoyed breakfast and made our sandwiches without a rush. Fog was in the forecast. We made our way over to the float plane pond around 1pm to get everyone weighed up. After the Pond, we traveled up to lake Aleknagik where we had the incredible opportunity to watch the height of the sockeye run as they swam past the dock at the head of the Wood River. We didn’t know it at the time but we were witnessing another record setting run. 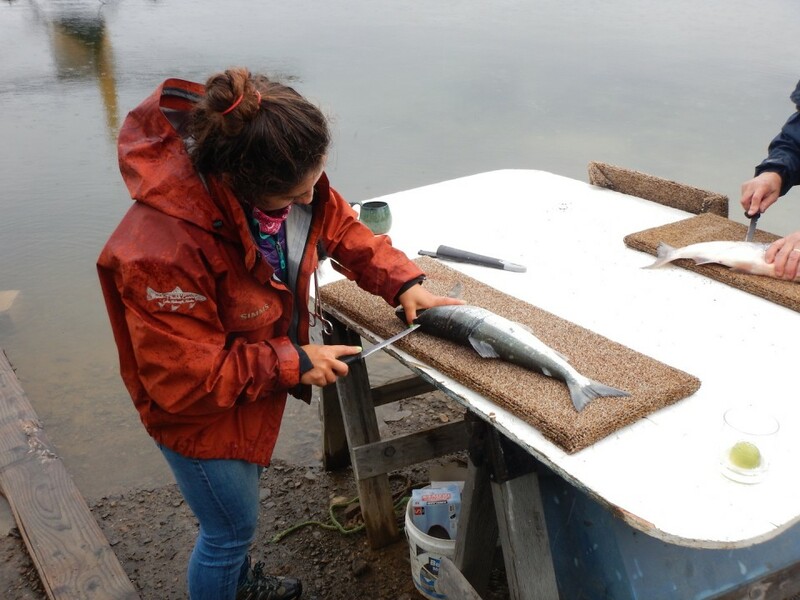 The final count of sockeye was over 7.1 million fish for the Wood River drainage alone! 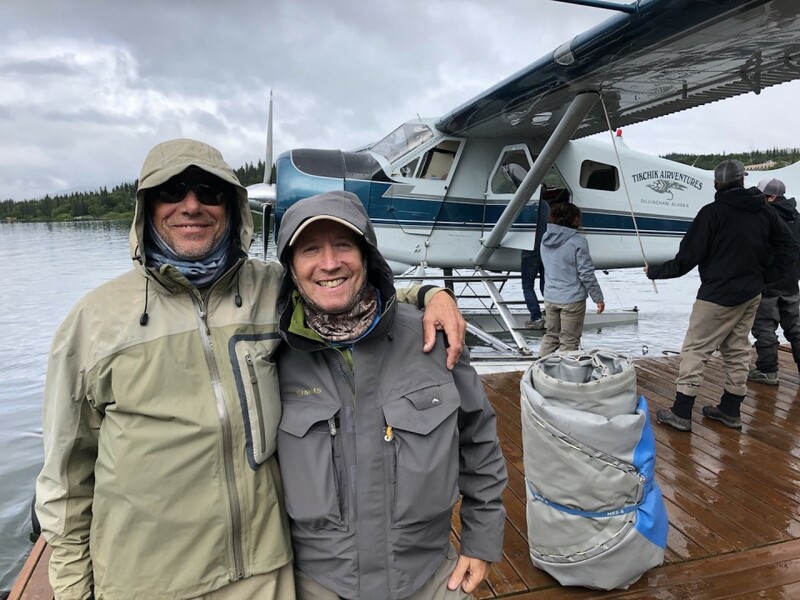 We saw a decreasing weather trend in the afternoon and after speaking with our pilots realized that we would not be able to get the entire group out to our destination of Pegati Lake. We had the fortune to find waterfront-lodging accommodations with an incredible view, thanks to our pilots. 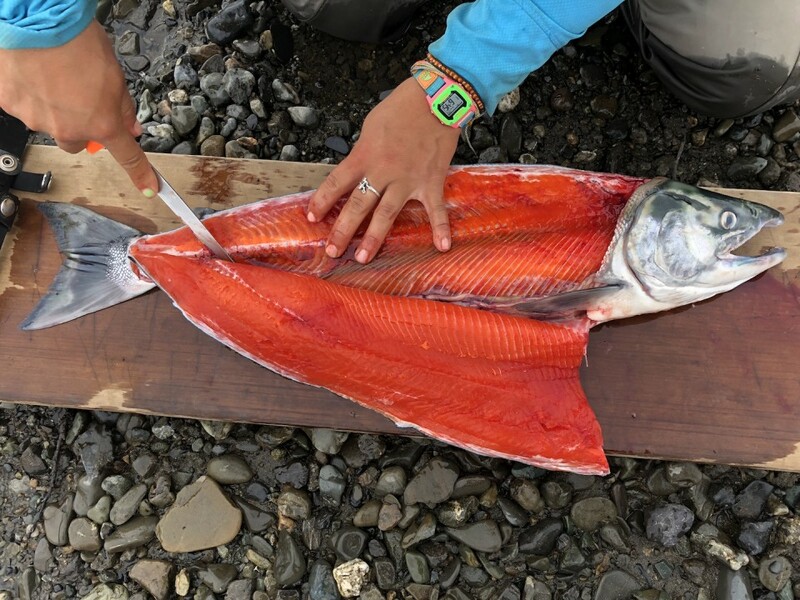 In the late morning we attempted to hook a few of the notoriously lock jawed Sockeye that swam past the dock with little success. 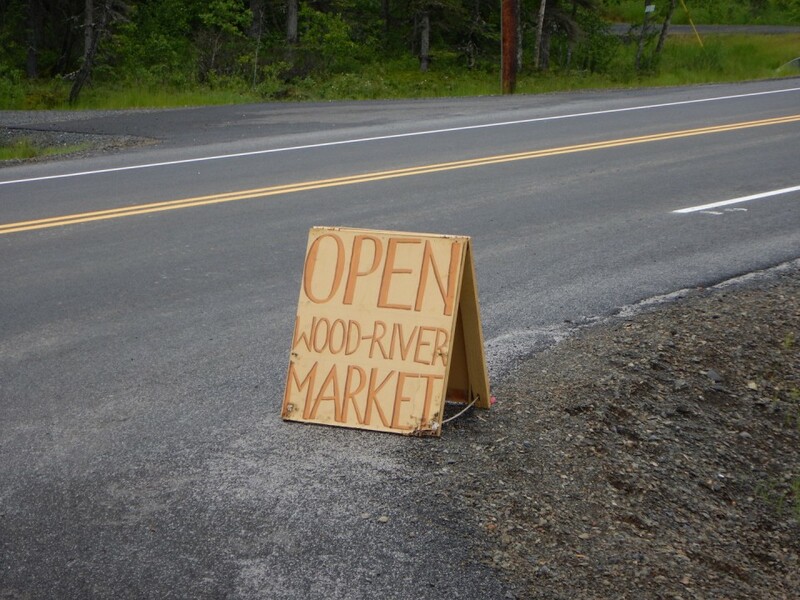 A party of eager anglers made their way down to the Wood River Bridge to try their luck. 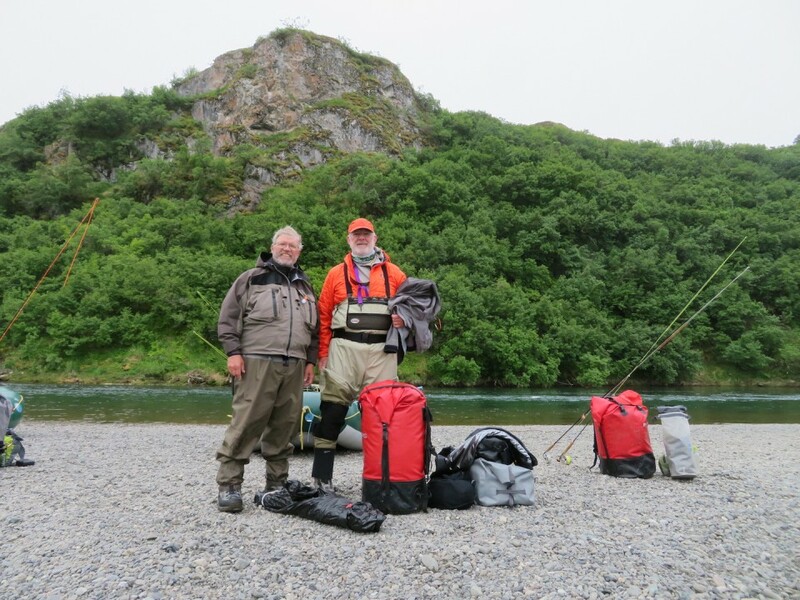 Before too long, Ralph Stevens caught a healthy Arctic Char, which was our first fish of the trip. 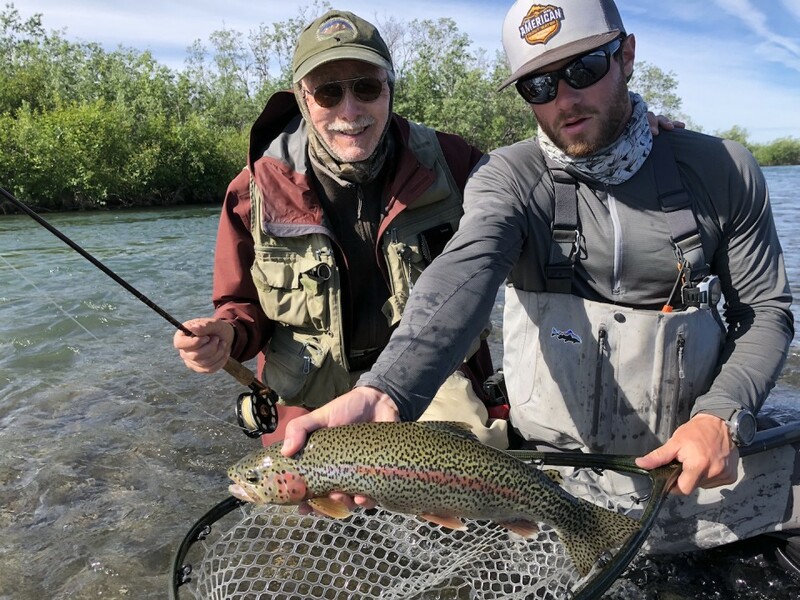 Jeff Jaacks (Frub), father of Guide Pete Jaacks was also along for the bridge mission and caught a nice Rainbow just before our trek back to the house for dinner. We filled our bellies and shared wine and laughter as the sun emerged in the evening to provide us a spectacular view. We had high hopes that the following day would provide the flying weather to get us to our destination. We awoke to low-lying fog in Mission Bay and had another leisurely morning of coffee and breakfast. We remained optimistic and broke down our rods to be ready for the float planes. By noon, the weather improved and our first group loaded for departure to Pegati Lake. Several Moose were seen by the group flying out. 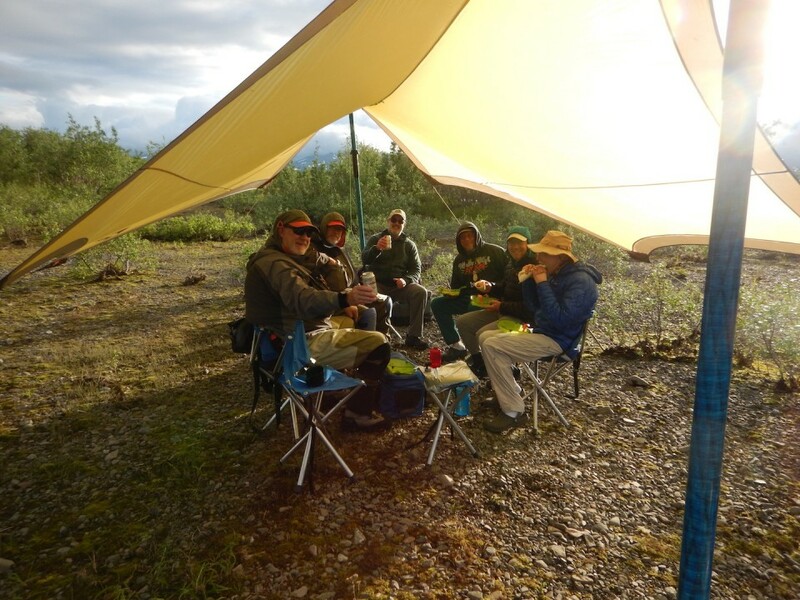 By 3:30pm the entire group was sitting at the headwaters of the Kanektok River. By 4:37pm our safety briefings were complete, boats were packed up, and we were ready to begin our river trip. We pushed hard for several hours but the high water aided us in swift navigation. 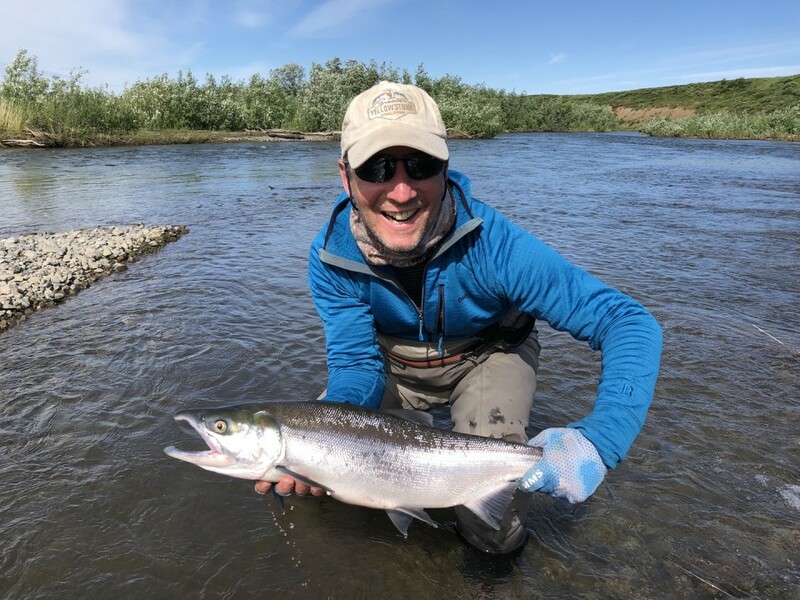 We took a quick break to stretch our legs after a couple hours but Dan Stephens couldn’t resist the quick opportunity to throw a mouse fly. A hungry post-spawn Rainbow crushed his fly down aggressively until he got the hook. After a short tussle, we put the 20” fish in the net, snapped a couple photos and released it back into the shallow water. 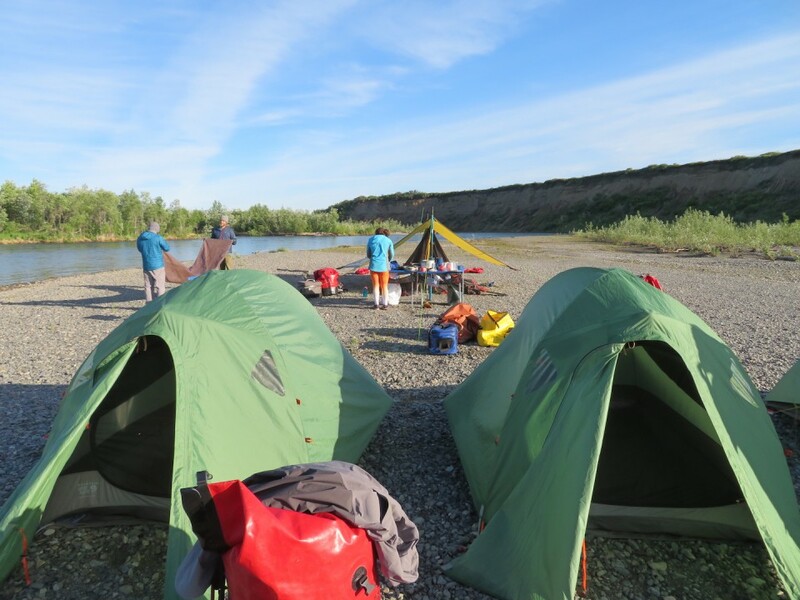 After the excitement, everyone had fish on their brain but the hour was late and we still needed to find a camp. 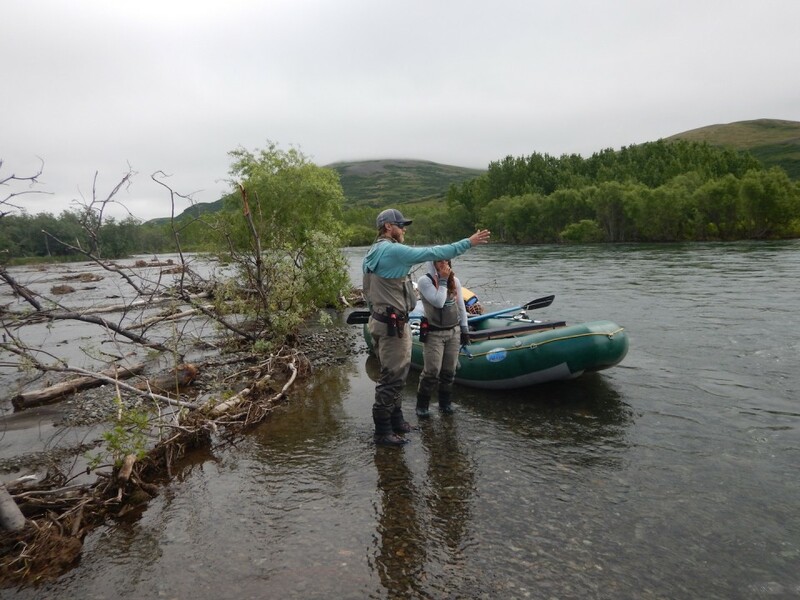 We continued floating and about 15 minutes later, the lead boat spotted a cow moose crashing through the willows. 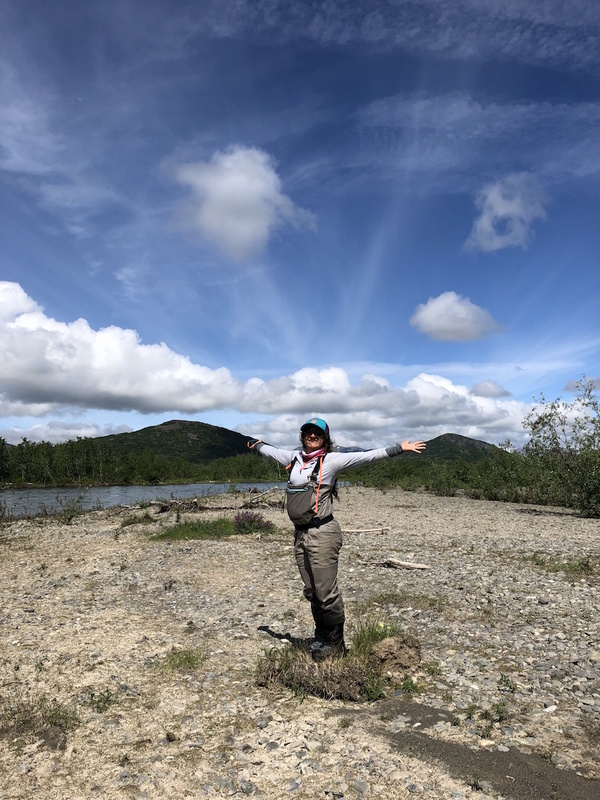 We made our way to the first major tributary of the Kanektok to find that the high water had chopped up the bar and, there were a pair of nesting Arctic Terns on the bar, so we continued our hunt for a camp. We settled on a good bar not far down from the creek and built camp quickly. 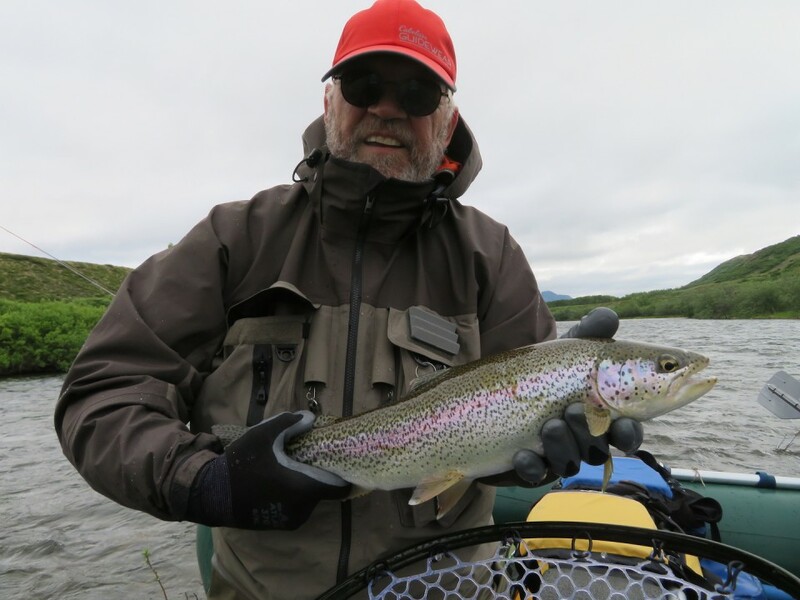 John Jaacks (Jr) needed to get his fix of fishing before dinner, so he explored our island camp and caught several rainbows to start things off. We enjoyed fish Tacos for dinner and retired out of the bugs into the comfort of our sleeping bags by 10pm. Light rain gave us a nice evening lullaby against the tents. We departed the gravel bar at 10:15am and after floating a short distance, two Moose were spotted on the river bank. Dan’s mouse success from the day prior had anglers eager to see some top water action of their own. Geoff started off his morning with a nice 20” rainbow on the “Bob Gnarly” mouse pattern. We didn’t know it at the time, but this would be the most productive mouse pattern of the week! The spring snow melt provided high water and we covered a lot of water at a fast pace. We stopped for lunch at a small side channel on river right that had a bit of moving water pushing through it. While most anglers made conversation around the lunch table, Dan explored the channel back into the brush, yelling “Hey Bear” as he went. The small channel held a big pool at the end and in that pool lay a 22” rainbow that could not resist Dan’s black/white dolly lama. We filled our bellies and continued down river. We came down to a large pool on river left where Jr hooked and landed a nice 22” rainbow on a streamer. 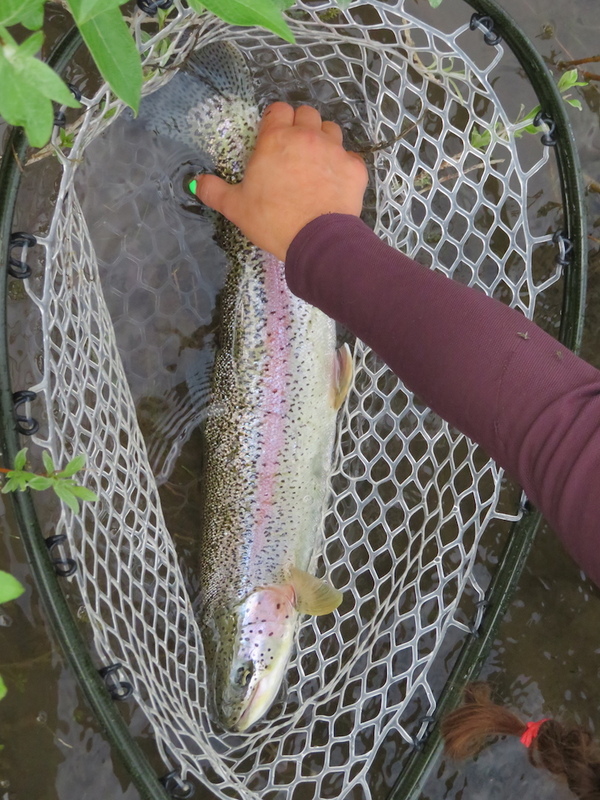 Several other large rainbows were hooked out of that same pool before continuing down the river. Many more rainbows and Grayling were caught on our way down to camp. 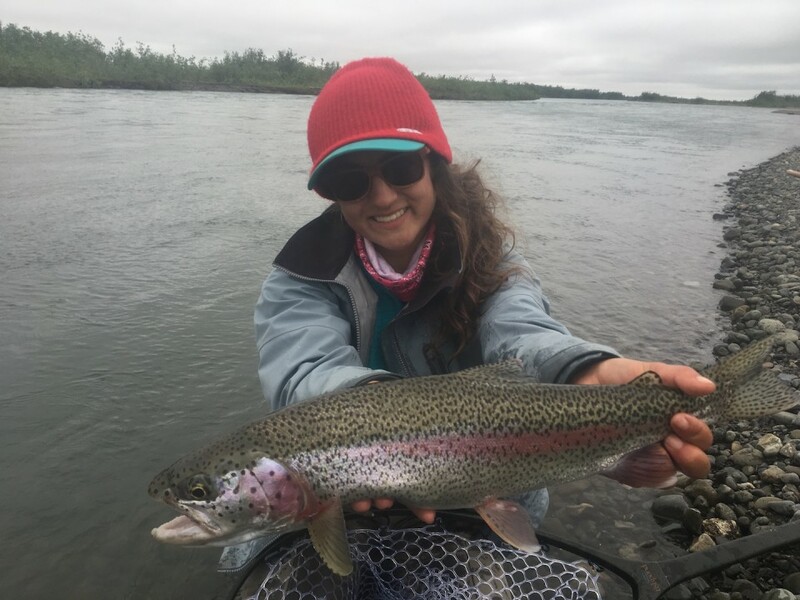 The logs report that over 2 dozen rainbows were taken this day in the 18”-22” range. 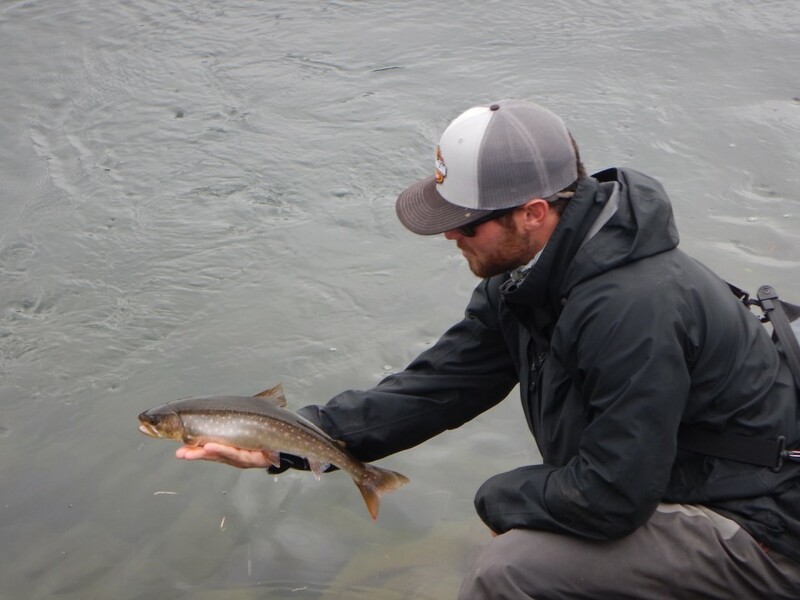 One of Ralph’s true goals was to catch Grayling on this trip and he accomplished his goal on our first day. 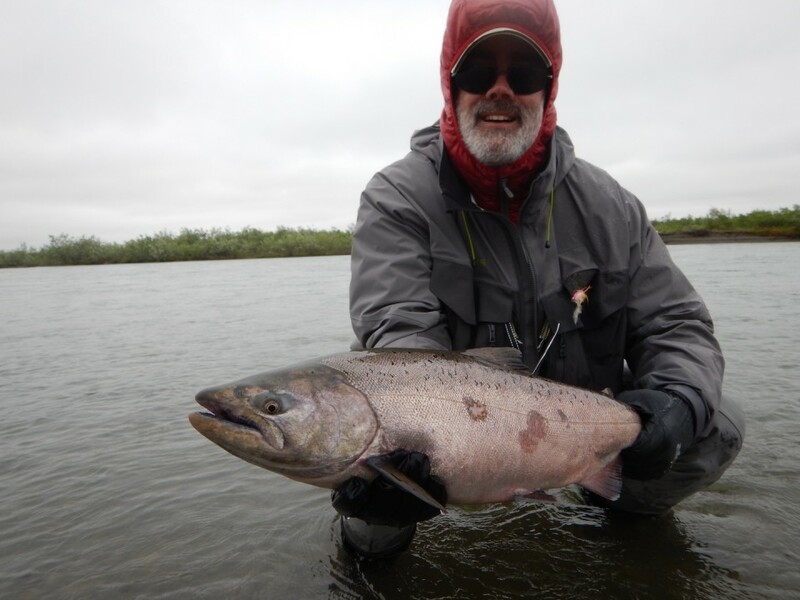 Logs report that we still have not seen good numbers of Salmon in the river. We enjoyed riverside Pizza for dinner and relaxed by the fire. The Barometer was reading 28.90 and rising with the promise of nice weather on the horizon. The overcast skies and light rains allowed our bodies to push the snooze button and collect a few extra Zzz’s. 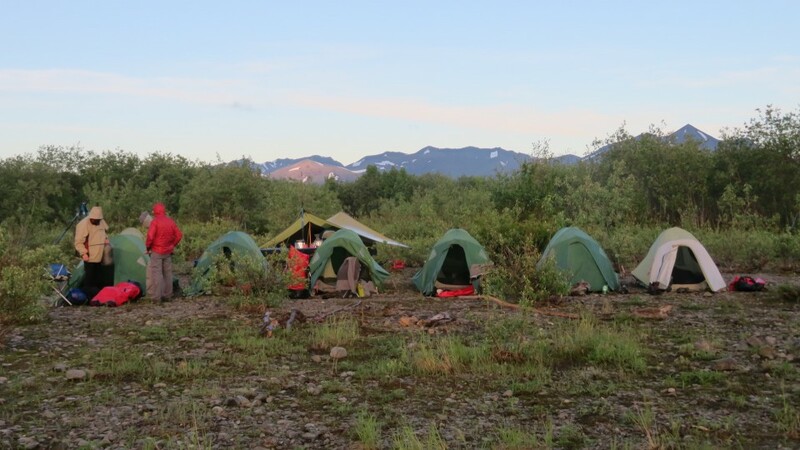 We emerged out of the shelter of our tents and the bugs were not far behind. It was a relief to push off the gravel bar and let the natural breeze on the river tame the bites. 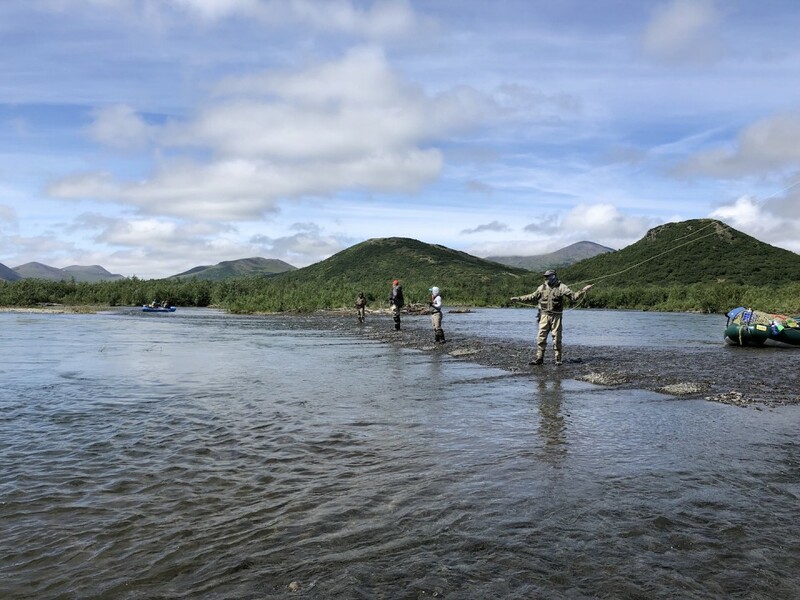 The morning fishing took a back seat to navigation as the river had changed in the past year. 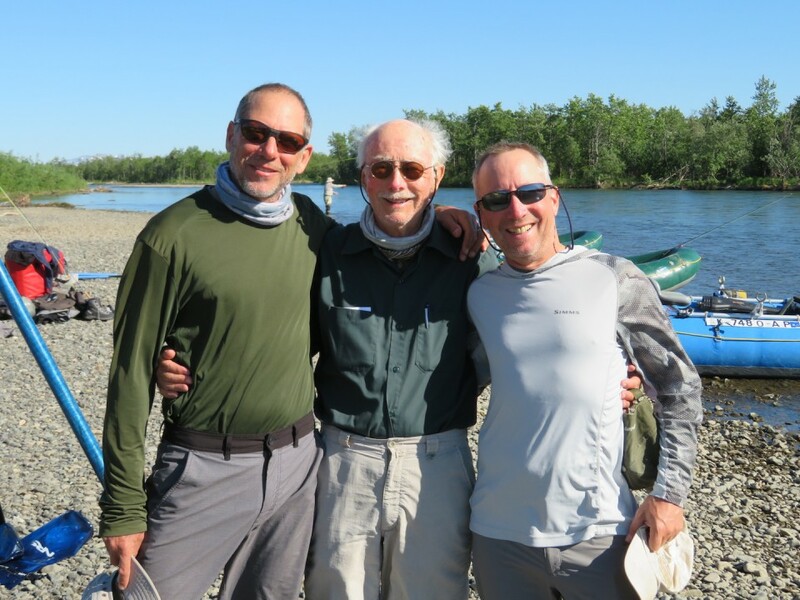 John, Dan and Ralph fearlessly led the charge down the river to scout channels and find the best route. After a bit of bushwhacking they radioed back with the correct channel to take after exploring the “wrong channels.” In the afternoon, the sun came out, the barometer rose and the bite got hot. The mouse fishing in the high sun was nothing short of epic. In Aubrey’s boat, Geoff caught a very nice rainbow on a mouse and Jr found a nice grayling at the bottom of the same island. 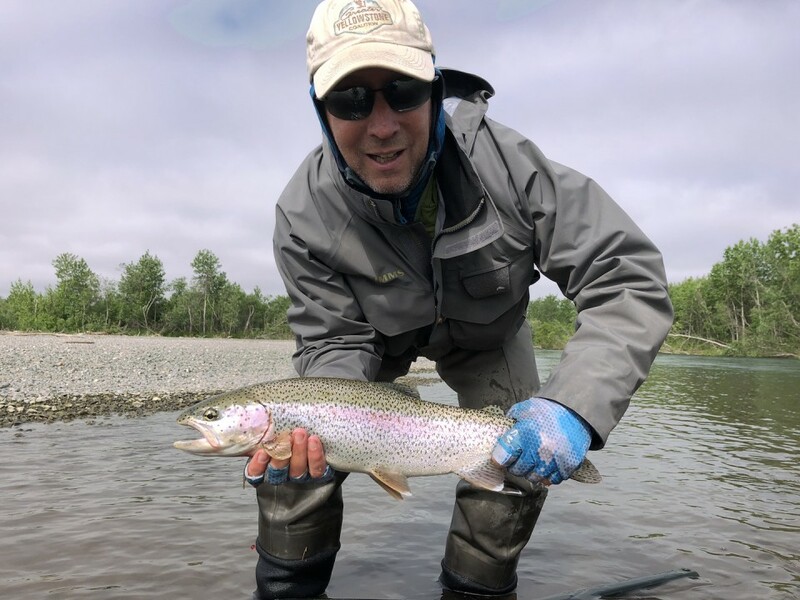 Dan was fishing his Bob Gnarly mouse in the afternoon and found an absolutely gorgeous 24” rainbow while wading a spillway. Ralph caught a nice Grayling out of the same hole. His angling experience prevailed with the streamer and delivered 4 bows over 20” in the afternoon alone! Aubrey’s boat spotted a great horned owl on the river. We setup camp at a lovely bar we have named “Falcon Bluff”. Frub explored the back slough behind camp with a streamer and found two very nice rainbows, 17” and 19”. 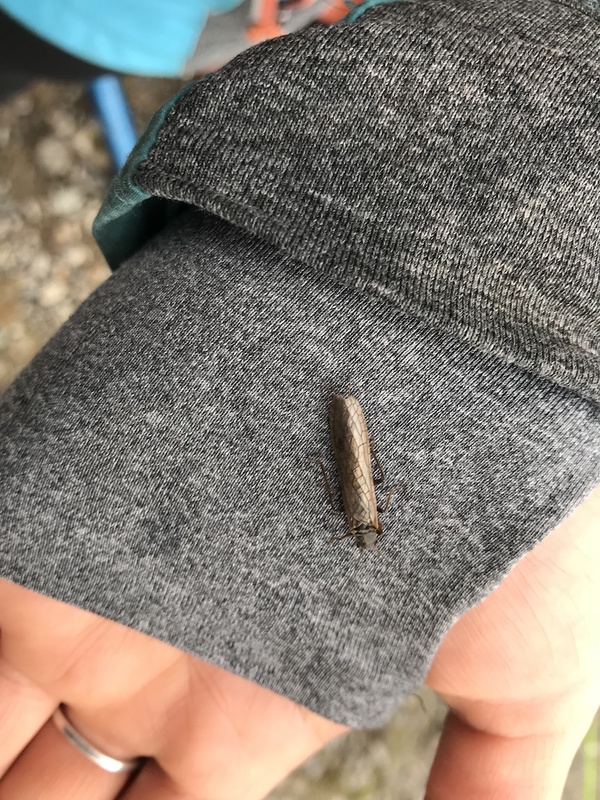 Starting in the morning, we had been seeing very large stoneflies in excess of 1” long and the Grayling were keyed in on them. We watched a pod of 8-10 fish feeding aggressively for about 20 minutes after lunch. Ralph got out the dry fly in the evening and caught a nice Grayling on top. The logs show this as the day in the season where we caught more Grayling then any other day of the year. Two large Tundra Swans flew over camp as a perfect cap off to the day. At 11:10pm when all the guests were tucked away, the guides viewed 4 bears, a sow with 3 large cubs across the river working their way up the bank. The bears were very blonde and this was likely their last summer with Mom. The morning fog burned off and the day became beautiful. Pete’s boat with Jr and Bruce found a pod of rainbows in the wood. They had several memorable fish that they sight fished in gin clear water. 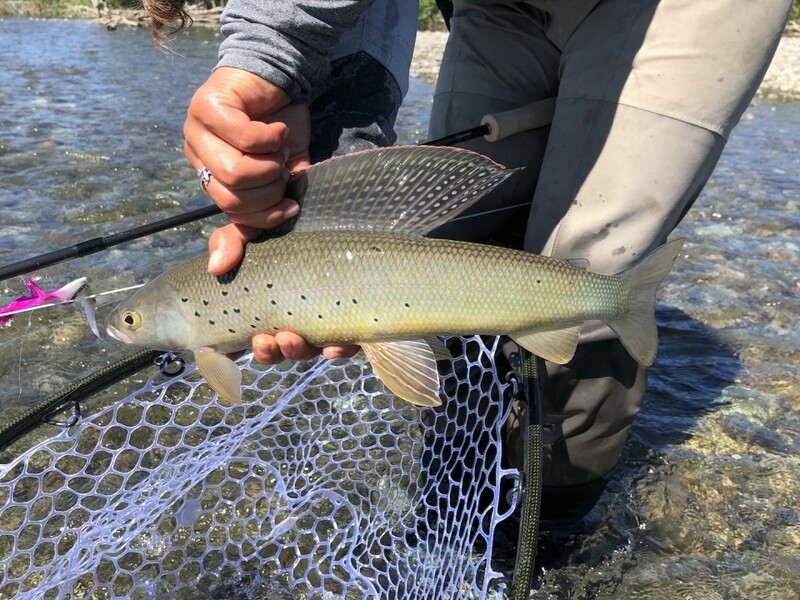 We saw very strong numbers of Grayling and rainbows eating big stoneflies and the group continued to catch good numbers of fish on dry flies. Ralph entertained the group during lunch as he targeted and successfully caught several rising Grayling. 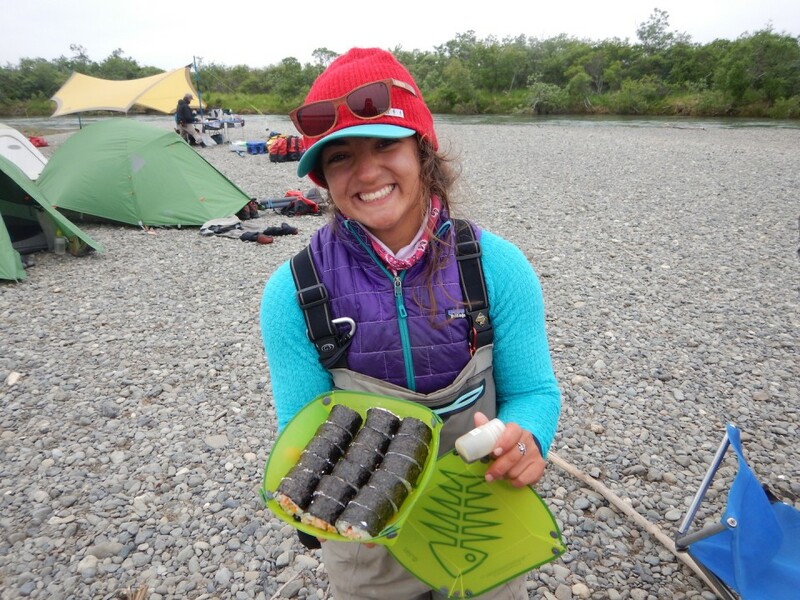 Never have we seen such a prolific hatches of big stoneflies on our rivers. 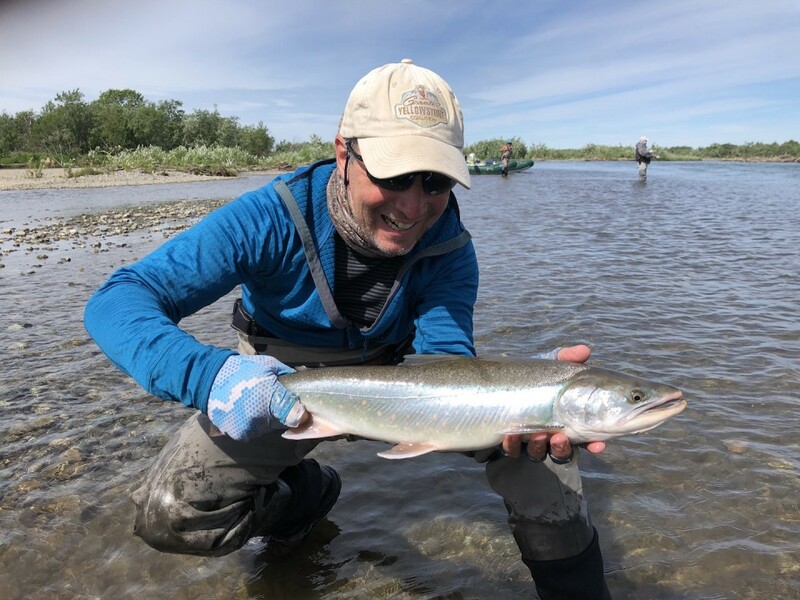 In the early season, the salmon have not yet entered the river system and the resident species (namely Rainbows, Grayling, Arctic Char) need to rely on sources of food that naturally exist in the river system apart from the Salmon migration. It’s a special time of year when we get to fish mouse patterns, dry flies, and natural colored streamers with confidence. Jeff and Dan both landed nice fish over 20” in a side channels. 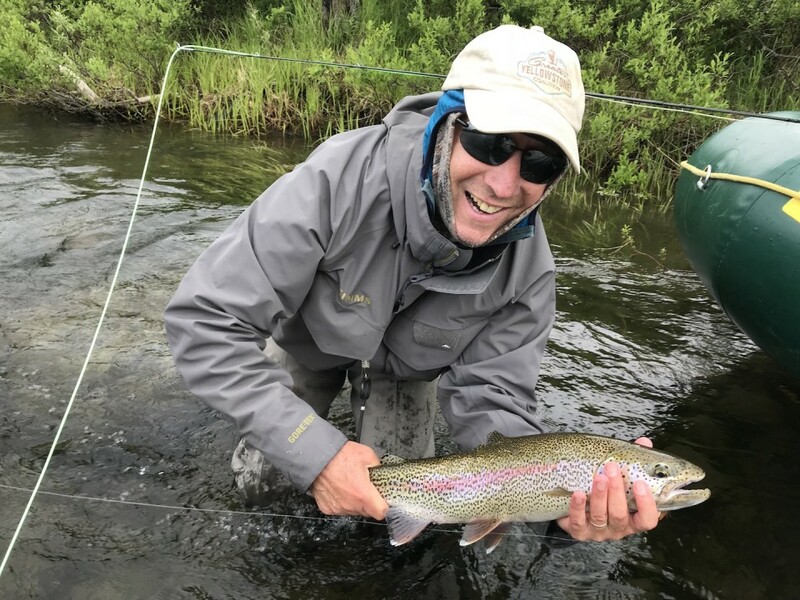 Geoff caught many Rainbows on mice and streamers including one over 23” that Aubrey scooped up for him. 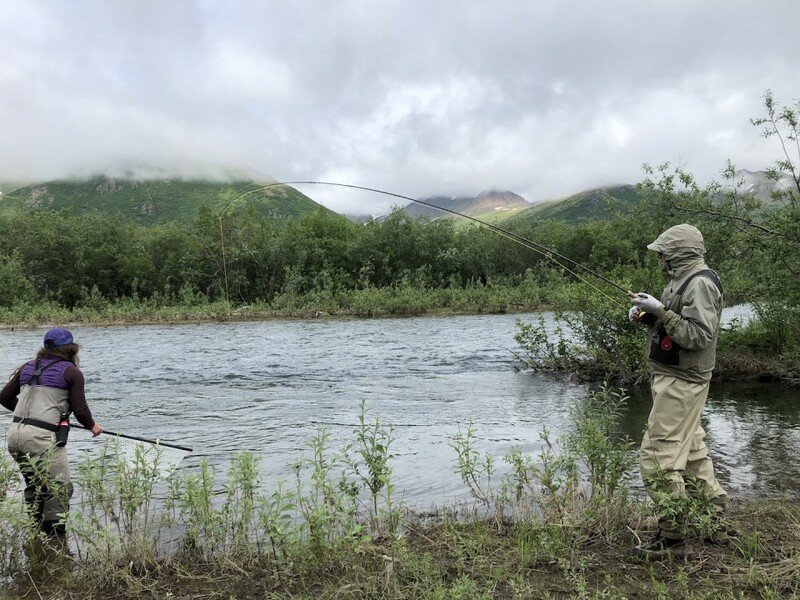 Note that more Rainbow trout were caught on this day then any other day of the season; four-dozen fish were caught and released. The salmon counting weir wasn’t set up. This could have been caused by a lack of funding or the absence of commercial fishing in Quinhagak village this year. We spotted a few salmon just above the weir and started seeing more as we worked our way down. We saw several Bald Eagle chicks in a nest just above camp. It’s incredible to see the size of these birds even when they are immature. The high sun brought out some rather fierce mosquitoes in the evening. 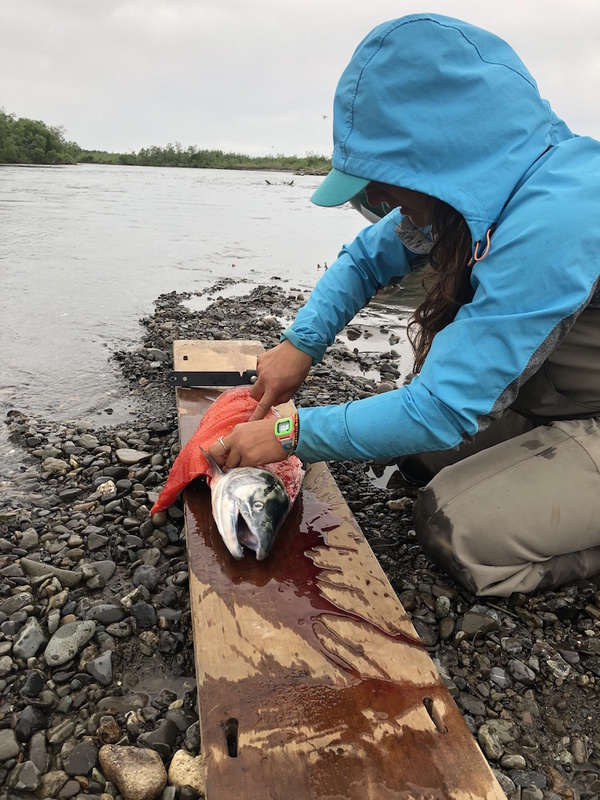 We began seeing a few strings of sockeye pushing up, but the numbers were still low and we were not able to get one to sacrifice itself for us to enjoy for dinner. Pete crafted up a lovely curry meal and we all got our fill before calling it a night. During the early part of the season it is not uncommon for us to experience chilly mornings. This can make for a little slower start to getting on the river. We hit the river around 10am. 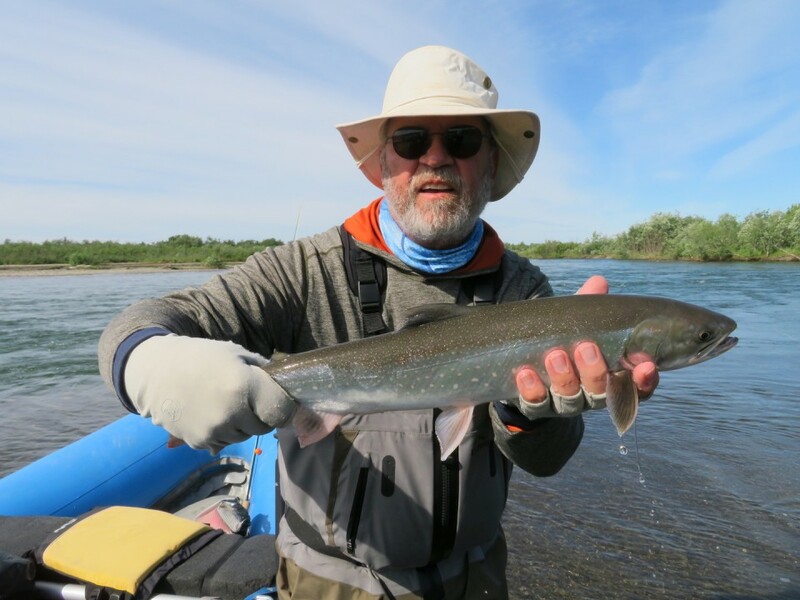 Ralph caught a nice rainbow in the morning in fast current and worked hard to put the screws to him and get him to the net quickly. 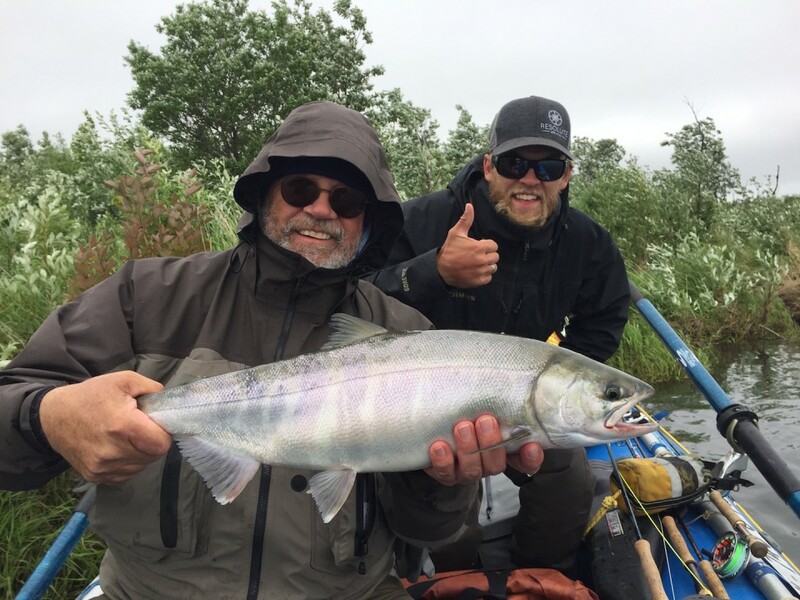 The first dolly of the year was caught by Jr in the “Jaacks Wagon” raft which consisted of three members of the Jaacks family. Frub also caught several nice Rainbows in Backwater sloughs. It made for an entertaining day for those in the boat and in other boats around. We observed a pair of nesting eagles with chicks in the nest for the second straight day. 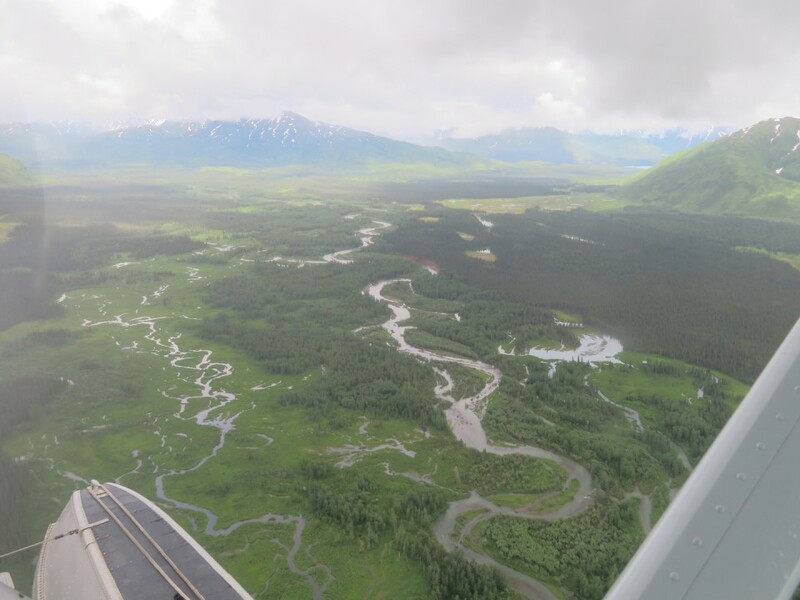 The eagle populations are looking strong in Bristol Bay. We also spotted a young bull moose in a side channel. 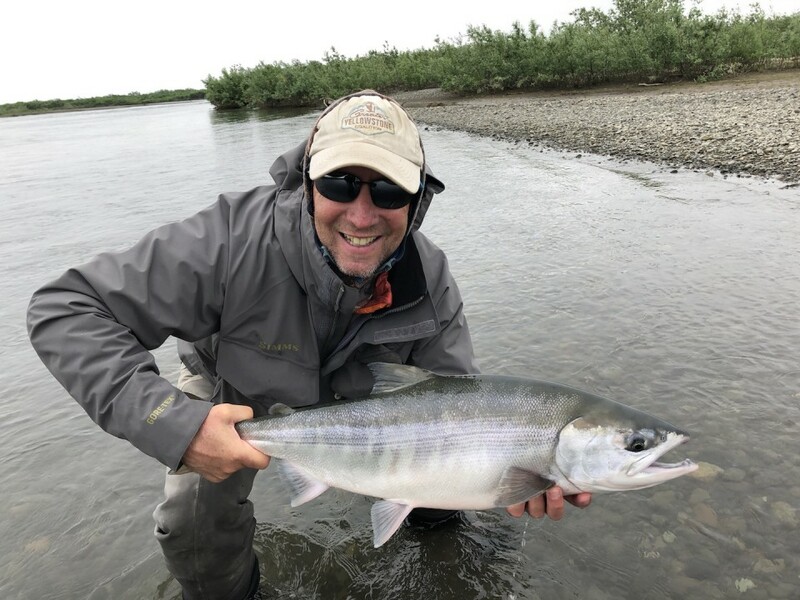 The chum fishing started to get quite strong and every angler had the opportunity to catch some of these tough fish, fresh from the ocean and pulling hard. Geoff caught the first bright sockeye of the year. On his first cast at the pod of fish, the lead fish turned and crushed his streamer. 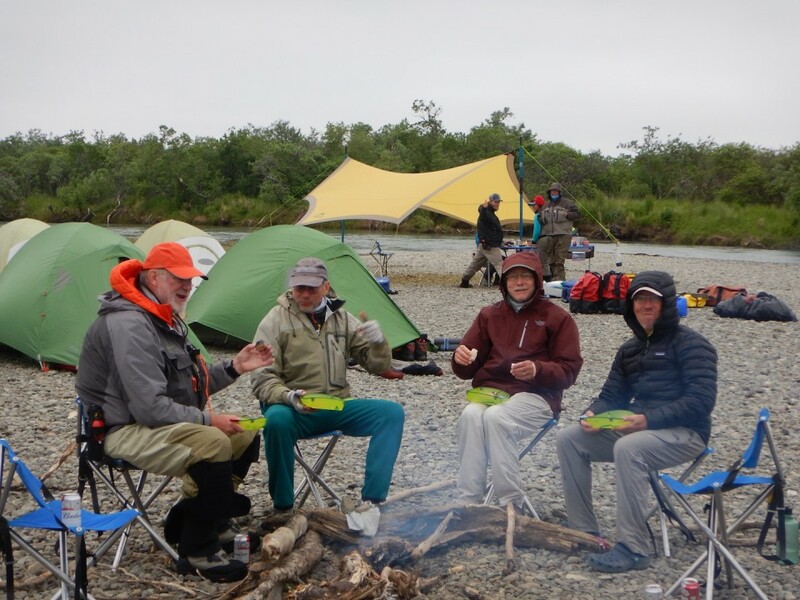 After a series of acrobatic jumps, we netted the fish and enjoyed it for a fresh sockeye dinner. 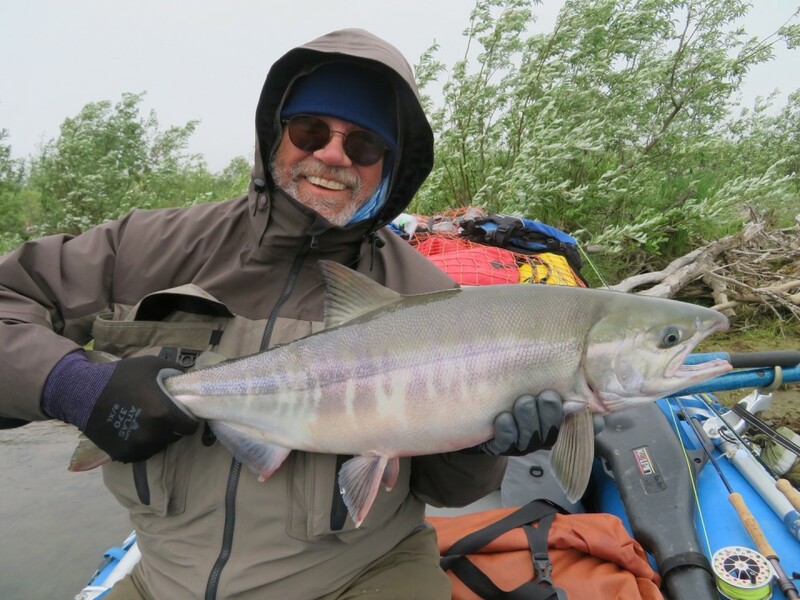 Ralph also hooked several Sockeye out of this same pod of bright aggressive fish. We had overcast and breezy weather when we went to bed. In the logs, our final full day was dubbed as the “Day of the Chum”. The skies were cloudy and the wind and rain stuck with us all day. 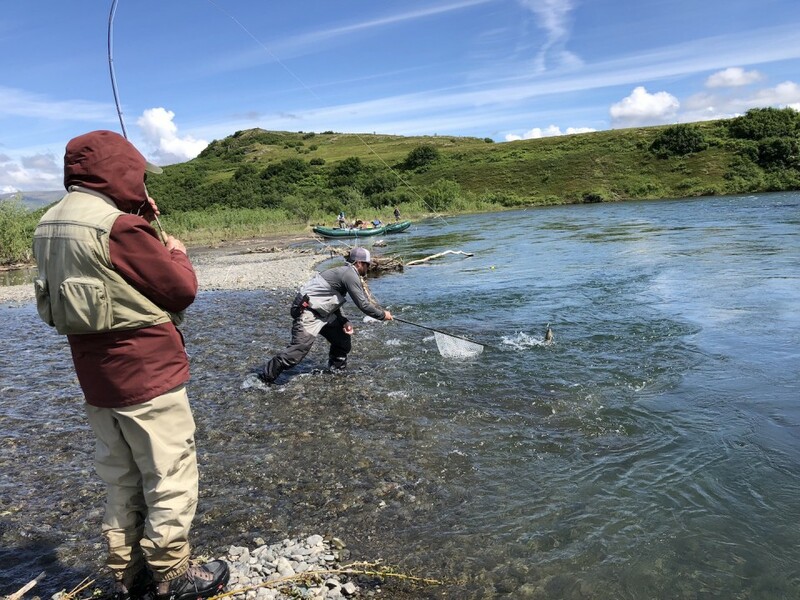 The fishing day was full of action and Rainbows, Char and Chum were caught consistently. Frub was fishing his 6 wt and ended up hooking into a 10lb chum salmon. After a proper battle, Frub was victorious and the fish was netted. Pete offered some words of advice following the fight, “Right fish, wrong rod”. Jr pulled 4 species of fish out of the same hole on a home brewed dolly lama. Chum, Rainbow, Char and Sockeye all fell for his fly. Jr selflessly turned over the hole and his rod to Bruce where he got into his first few chum of the day. 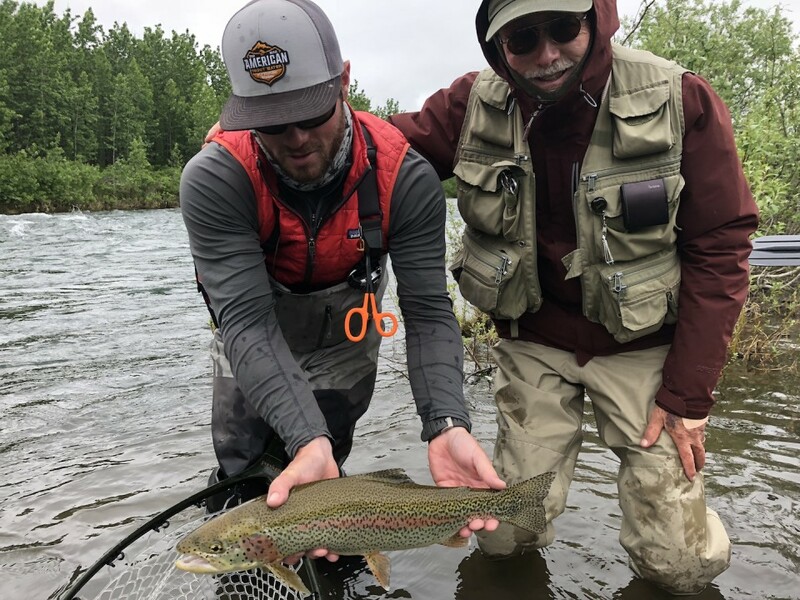 Geoff caught a monster rainbow on the streamer that screamed like a king salmon and was over 25”. At our camp bar, Bruce caught a nice king salmon fresh out of the ocean. The Char fishing finally picked up and we started to get some good numbers. 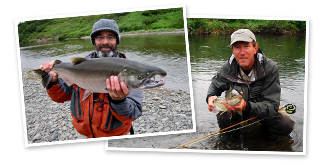 We kept a couple of them and enjoyed fresh Dolly Varden char sushi for dinner. The group sat by the fire and enjoyed dinner and thought back on an incredible week. Takeout day: The group woke up with the sun and a true alpine start. We pushed through the lower river with the tide pushing gently back against us. We descended upon the town dock of Quinhagak where several boats lay lined up along a muddy beach. The rafts were unloaded and broken down. Some of the guests walked around the port and conversed with the local Yup’ik community members. We were shuttled to the Airstrip by the local village corporation staff where we waited for our airplanes for nearly 8 hours. Our initial flight plan was delayed so we began to mobilize some alternatives. 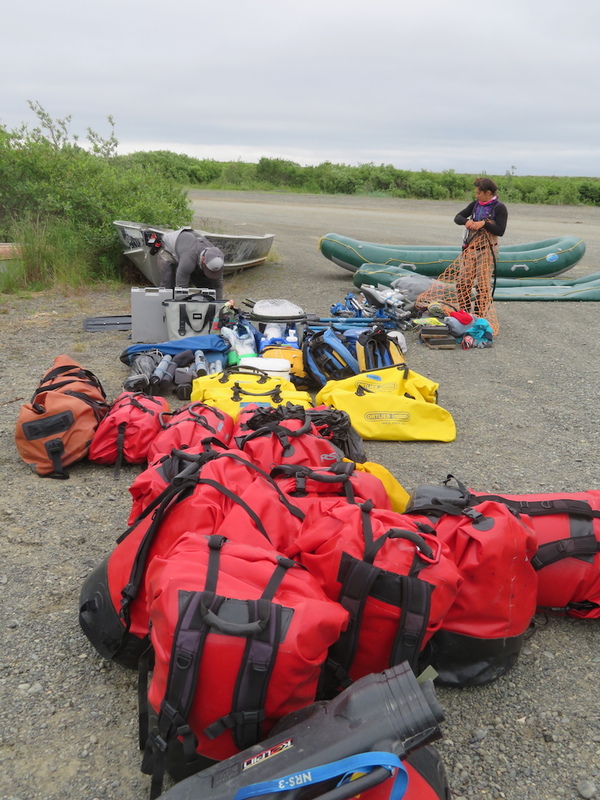 It was late when the final plane arrived in Dillingham but we were all safe and in our intended destination. 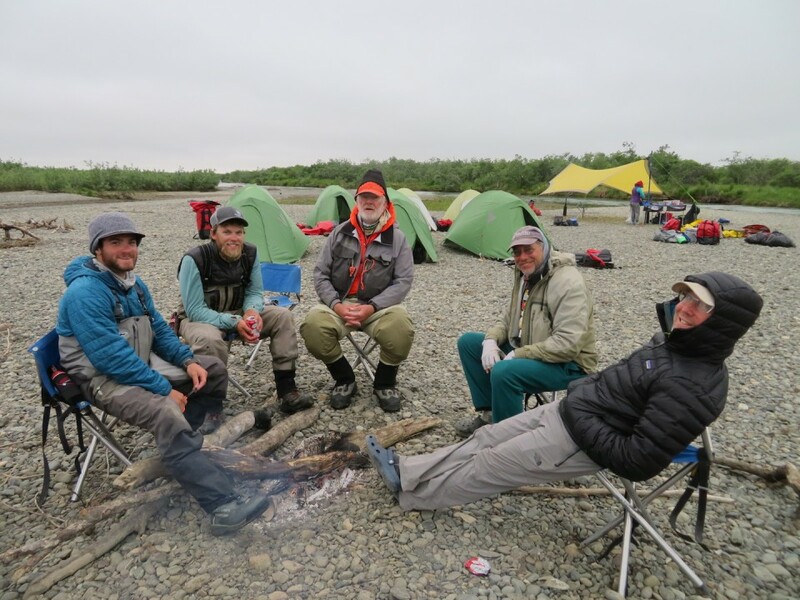 Everyone ended up spending an additional night in Dillingham where we enjoyed burgers and beverages before the group of hard working anglers retired to sleep in the comforts of a bed for the first time in a week. 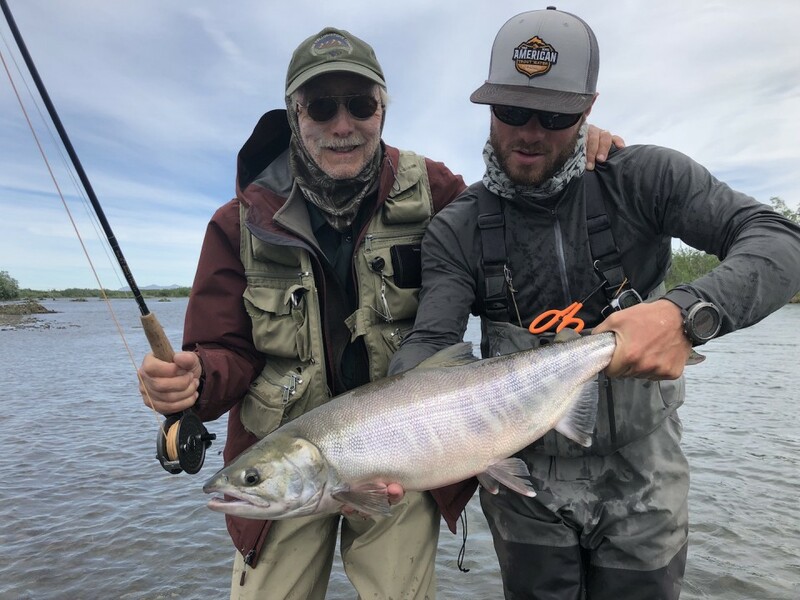 The first week of the season is always a special adventure when we have no prior angling or navigability reports because we are always among the first float parties of the season. 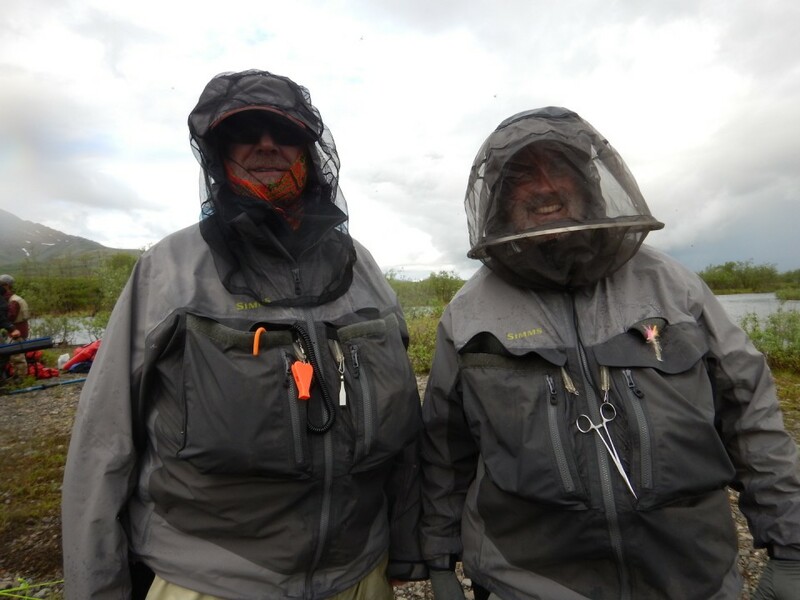 This adventure was a glowing success and seeing the late spring ecosystem in full function was enchanting.